One thing that struck me when proof reading our Towards a New Jerusalem exhibition was how precarious life could be before 1948. I was quite shocked to see that six year old Pat Seaby had to rely on charity to be treated for scarlet fever in 1944 and without the lottery of this financial support may have died. it got me thinking of looking at how the NHS has impacted on death rates in this country over the last 70 years. Peter at the archives pointed me in the right direction and I came across some brilliant material by the Nuffield Trust that looked at the breakdown of deaths over this period. Seventy years after the founding of the NHS, 20th century deaths and the 21st century mortality files give us a record of the underlying cause of death for every person who died in England and Wales in 1948, the year in which the NHS was founded, and in 2016. One striking fact is that the actual number of deaths in 2016 (525,000) is only around a tenth more than the 470,000 deaths in 1948. Yet the population of England and Wales in 2016 was almost half again as high. Each person is just less likely to die in a given year in the 21st century than they would have been in the mid-20th. Despite a troubling rise in the mortality rate in 2015, it remains far lower than it was in the mid-20th century. We can see positive developments particularly clearly in deaths from heart disease and strokes, both of which have fallen by 40% since 1948, even as the population has grown. This probably reflects advances at every level of medicine. Statins and other drugs have improved prevention, new immediate interventions to break down blood clots have been developed, and there is better care after people experience an attack. On the other hand, cancer claimed nearly twice as many deaths in 2016 as in 1948. Dementia is somewhat difficult to classify due to the widespread practice in 1948 of simply logging “senility” as a cause of death. But even if we add together “senility” and dementia, deaths from these causes have quadrupled. These are not merely increases in the proportion, but in the total number of deaths. Pat Daniel, formerly Seaby, the little girl who almost died in 1944 passed away from ovarian cancer in 2018. I am almost certain that the NHS had played a major role in extending her life but the stats seemed to show that things did not look so positive with regard to cancer with deaths increasing quite substantially. However reading through the evidence provided by the Nuffield Trust it appears deaths from cancer diseases have risen, not through lack of progress in improving the things that make people healthier, but precisely because of the success achieved. Better diets, lifestyles and health care have lengthened our lives, but in doing so have increased our chances of dying of diseases associated with old age. Selecting the archive material we used in our teaching pack, we included details of how Joe Seaby's wife Florence "Dibs" Seaby had contracted TB as a young girl and was fortunate that she had access to the Victoria Children's Hospital, a charitable institution that was based in Tite Street, Chelsea. Some of the most dramatic advances in 20th century medicine came against infectious diseases: universal vaccinations that stopped diseases spreading in the first place, and antibiotics that killed off bacteria in the body. Perhaps the most dramatic difference can be seen in tuberculosis, the disease that had Dibs Seaby had contracted and led to her lengthy convalescence at the Victoria Children's Hospital and at their Convalescent Home annex in Broadstairs, Kent. for centuries a major killer disease and a powerful cultural symbol of death and illness once called the “white death”. In 1948, more than 20,000 people in England and Wales were killed by tuberculosis. By 2016, deaths had fallen to just 196 – a number so low that it represented 0.0% of deaths that year. But again, progress is not universal. It is difficult to be precise due to the changes in how doctors understand, detect and record diseases since 1948, but it appears that deaths from urinary tract infections and sepsis have risen over this period. Again, this may show the side effects of progress. Deaths from both are much more likely in the elderly. In 2016, antibiotic resistance was starting to take away some of the new capabilities that medicine was gaining in 1948, soon after the introduction of penicillin in World War Two. And chemotherapy, although a major advance against cancer, increases vulnerability to sepsis. Suicide, violence and accidents cause sudden, tragic deaths over which the NHS can have limited control. Trends here reflect more about the society and economy in which the health service began, compared with that of today. Suicide now accounts for slightly less than the 1% of all deaths it caused in 1948. This reflects a longer-term trend of improvement since suicide peaked in the grim economic era of the Great Depression. Deaths from murder, though, have nearly tripled from 217 to 605. Partly this is due to population increase, but it also reflects a rise in the rate of murder and possibly a broader scope of “homicide” since 1972, which has been redefined to include manslaughter. Meanwhile, more than 100 civilians died from operations of war in 1948 – either survivors of the Second World War, or casualties returning from the ongoing war in Malaysia. Nobody was recorded dying from war in 2016. 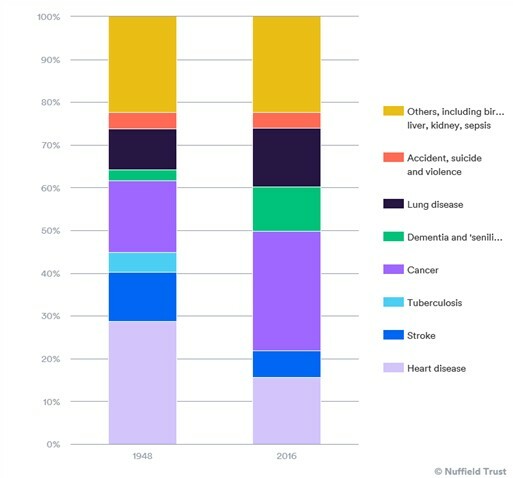 Perhaps surprisingly given the demise of dangerous industries and the rise of health and safety over the last 70 years, deaths from accidents have risen from 13,000 in 1948 to 14,000 in 2016. But this makes far more sense when they are broken down. In 1948, traffic accidents caused 3,800 deaths, which is now down to 1,700 even as car ownership has soared. In an era of heavy industry, accidents in mines and quarries accounted for nearly 500 annual deaths. Today just a handful of people are killed, even by the diagnostic category of which this is today merely a subset. However, deaths from falls actually appear to have risen from 4,000 to 5,600 – even though in 1948 the same category covered landslides and crushing injuries too. Why? Again, we can look to the very successes of health care and living standards in prolonging life as the explanation. While the trends in other industrial accidents suggest the rate of catastrophic falls from height or into machinery is probably lower today, a simple fall on a hard surface can cause a devastating injury for a frail older person. Perhaps surprisingly, the ledgers of death from 1948 and 2016 often tell an uplifting story. Through the NHS, regulation and rising standards across society, we have actually begun to overcome some of the biggest killers in the year of the health service’s foundation. Even where deaths have risen, it often seems fair to conclude that it is a result of successes. Our victories against industrial accidents and tuberculosis serve as a reminder that in decades and centuries to come the grim reapers of today may also fall – though they, in their turn, may also be replaced.